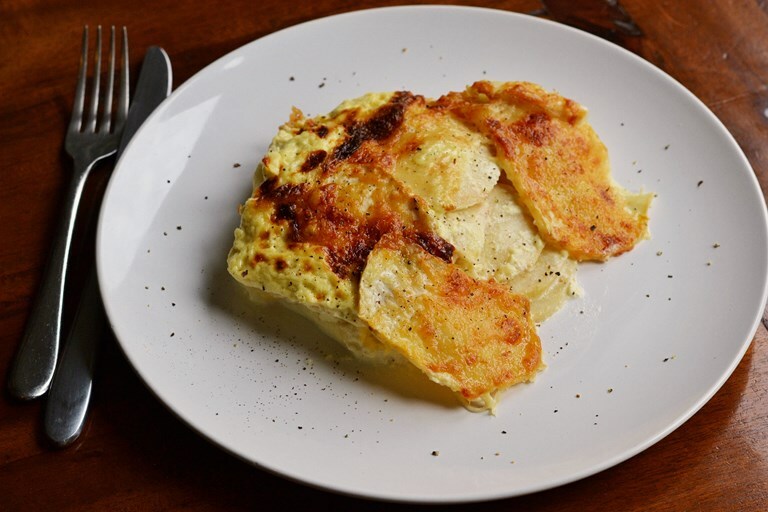 Danny Kingston's marvellous celeriac dauphinoise recipe is topped deliciously nutty Gruyère, a wonderfully comforting side or light meal that is a little lighter than the classic potato version. The word ‘Dauphinoise’ always brings music to my ears. Not only only does the word sound melodious, soporific, seductive even; whenever it is pronounced aloud, I often have a tendency to go all gooey at the suggestion. “Phhhwwworrr dauphinoise,” I’ll often find myself muttering. In the kitchen, all alone and rubbing my knees. Sometimes in restaurants too, which has been a problem. Why? 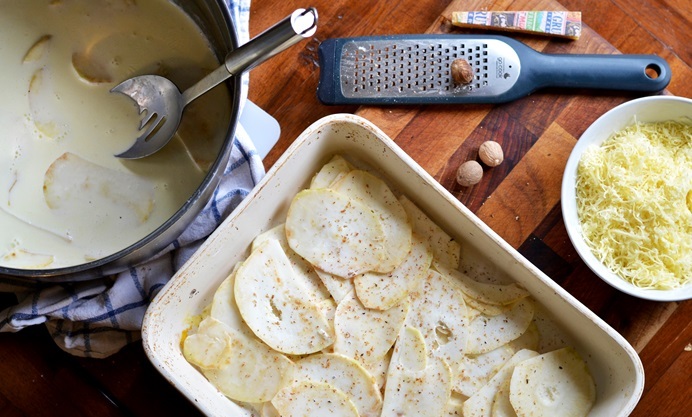 Well, nothing really beats this marriage of potatoes, garlic and cream does it. I love spuds in all their shapes and forms and the multitude of ways to cook them but rich dauphinoise tops the list every time. For sheer luxury if anything else. Especially when you go that extra mile and sprinkle some cheese, such as Gruyère on top. As soon as you take a bite, I am sure that neurons in the brain start to ping faster, sending forth messages to consume and consume and eat and eat. That primordial survival instinct still exists inside us, a craving for energy and fat, and dauphinoise caters perfectly for that need. In fact, my wife has mentioned in the past that I do turn a bit caveman whenever I eat it. 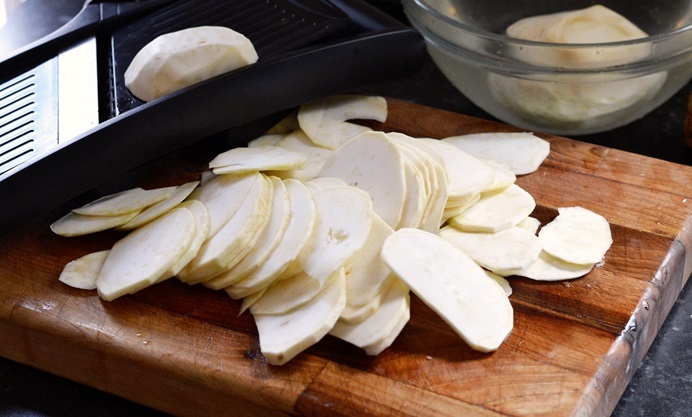 This can pose a problem though, particularly if your waistband is tight, so it pays to mix things up a little and introduce a different root vegetable into the mix every now and then. Such as celeriac for instance. Now, I am not claiming that this gnarly relative of celery is the next superfood. Nor does it have amazing weight-loss properties. 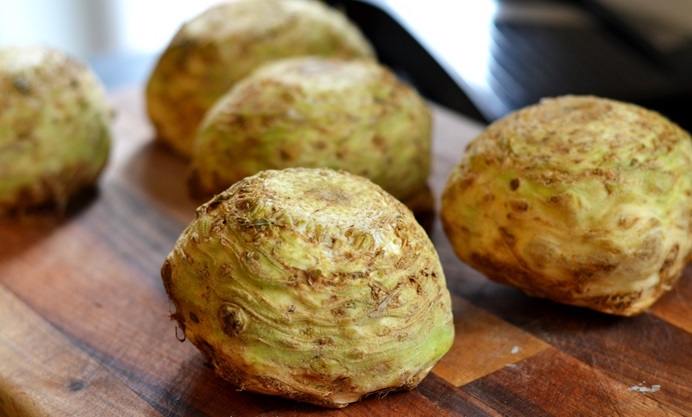 What I have found though, is that when I have introduced celeriac in place of potato, it does have a slightly different effect on the palate; bringing a lighter, nuttier bite to proceedings. It tastes ‘healthier’ in other words and it certainly has fewer carbs. I also tend to hold back on the cream and add a touch of milk instead. 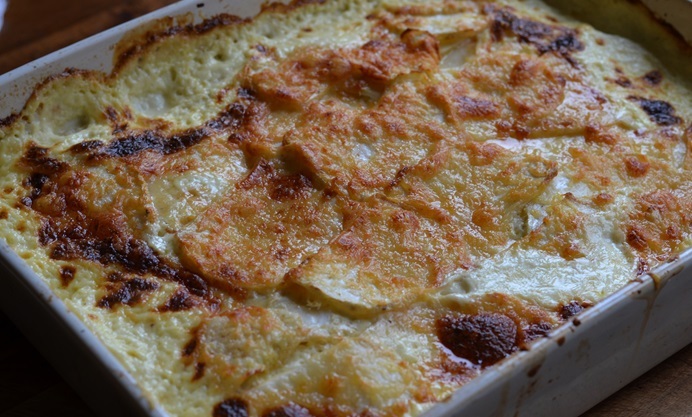 Again, milk does make quite a regular appearance in dauphinoise recipes but you don’t need too much, as celeriac has a higher water content than spuds and you don’t want to end up with a soggy gratin. Adding a touch of nutmeg delivers a spicy new dimension too, alongside the traditional garlic. But the cheese remains the same (because we cannot forgo the cheese). Besides, a layer of Gruyère piled atop the piled slices brings no fear; it is very low lactose and gluten-free after all. Yes, despite all these little changes, it all still amounts to a killer match for the ol’ tastebuds. However, the downside is that you will probably up eating a lot more of the stuff. Oh well.